is soothing and inspirational year round, and though facilities are geared down somewhat in the winter, it is always open as soon as they can get the road plowed after each storm. Big Meadows may be the only gas station open in winter (62 miles from cabin). For history buffs, here’s a cool “then & now” photo comparison in SNP. Here’s a great article on Things To Do in Front Royal. & some up and down the Valley. Take a downtown walking tour, or Battle Of Front Royal driving tour. Check out the Front Royal Visitor Center. There are several really good antique shops in downtown Front Royal. Order a picnic lunch for your next day’s outing & pick it up at 8 am. 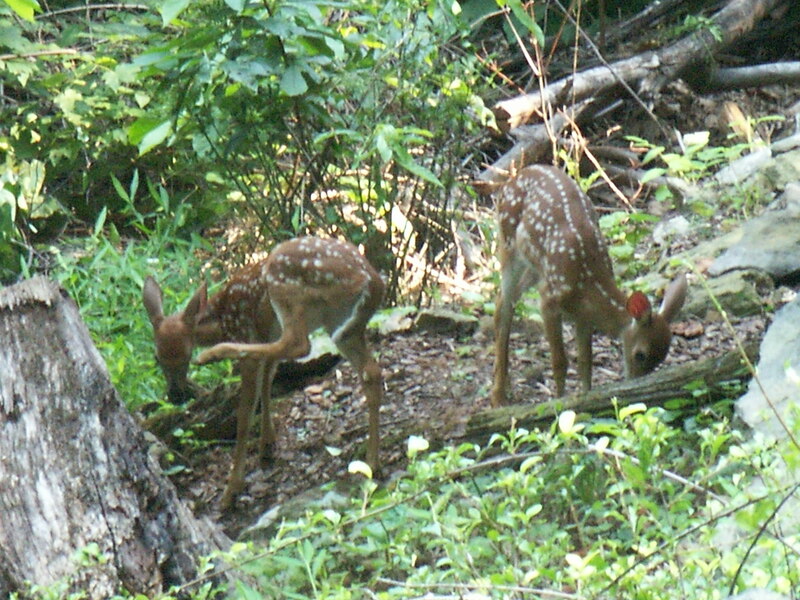 Blue Ridge Reserve is a 1200 acre conservation easement wilderness accessed directly below the cabins, but it has no marked trails – only a network of overgrown logging roads. So if you’re not an experienced backwoods hiker willing to just trudge off into the forest, you might prefer to access the logging road network directly off of High Top Rd. From either cabin head downhill on High Top about 1/4 mile to its lowest dip (and just slightly uphill to the north of that) where on the downhill side of the road you’ll see an overgrown road (with a gate about 30 ft down it) and a Blue Ridge Reserve sign that says “No Trespassing” (You can ignore that – we have the owner’s OK – it’s only meant to keep out ATVers. It is private property though, so hike through respectfully.) At each fork in the road you may want to mark your turn so that you can find your way back. 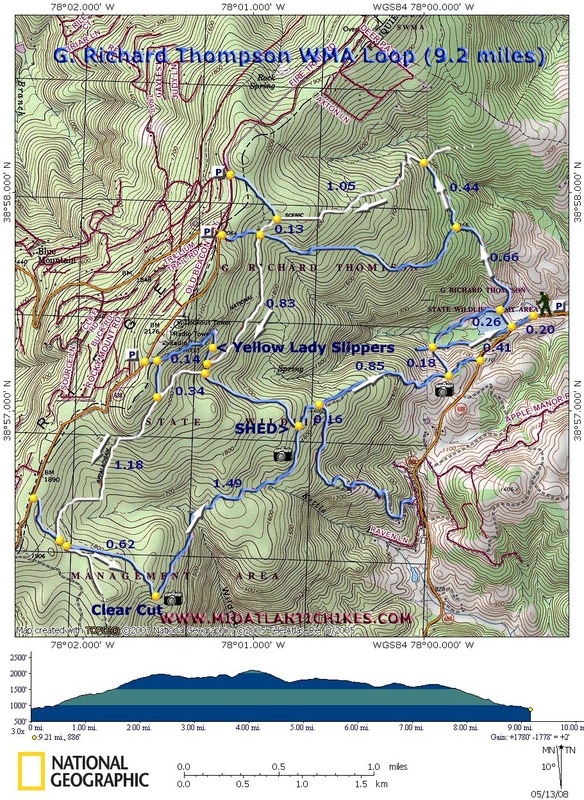 Appalachian Trail interactive mapThe AT is about a 3 mile hike from either cabin. The closest trailhead parking is via the G.R. 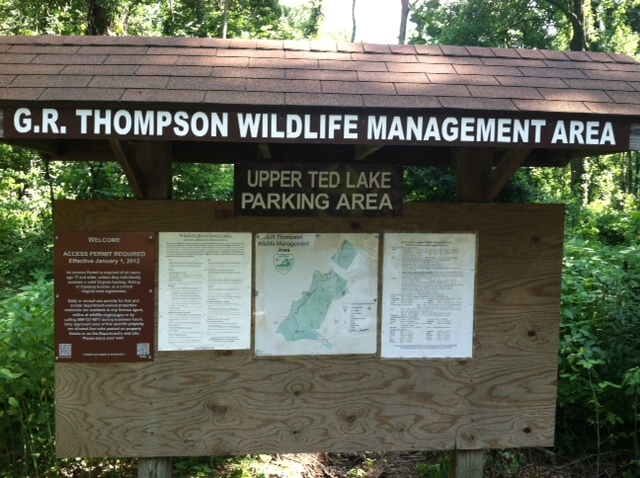 Thompson Wildlife Management Area (see directions below). 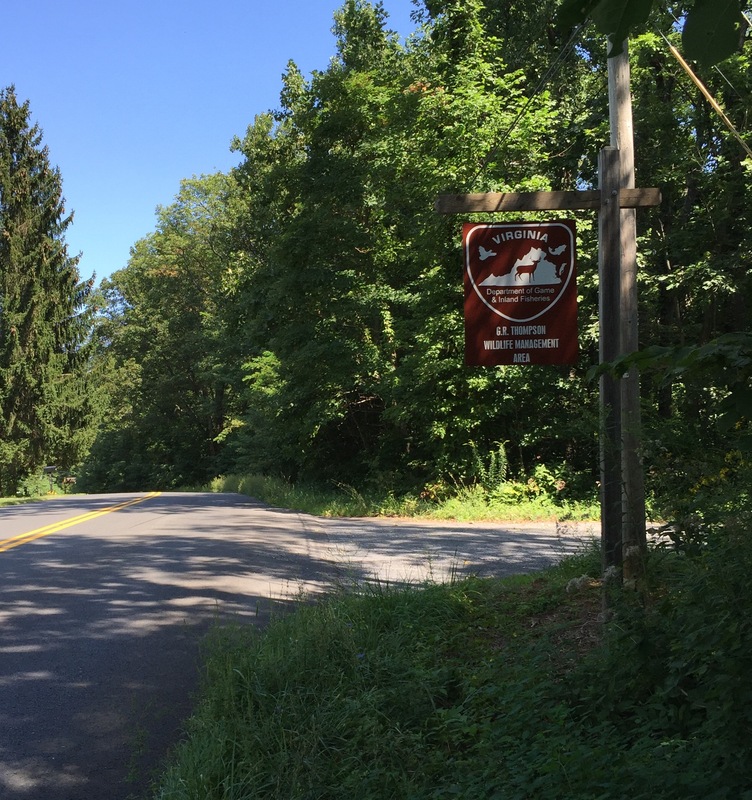 The next closest is the Trumbo Hollow Hike Trailhead on Rte 55, John Marshall Hwy at the intersection of Rte 725, Tucker’s Ln 4.8 miles from Rainbow View Cabin / 5.5 miles from Valley Vista Cabin (only holds 3 or 4 vehicles). Another larger lot is just .1 mile north of there up Tucker’s Ln just past Walker Ridge Dr. And of course there are abundant access points along Skyline Drive. G.R. Thompson Wildlife Management Area (2 mi. )is the closest access to the AT. The trailhead parking lot (the closest of 8) is 1.5 miles from Rainbow View Cabin / 2.2 miles from Valley Vista Cabin, just past the winery on the right. A hanging entrance sign marks the parking lot. (Google estimates the hiking distance from the cabins to the SNP boundary at about 15 mi./ 6 hrs.) About .8 mi down the fire road is the AT and the Manassas Gap Shelter (one of the old shelters built by the CCC back in the ’30s). The Thompson WMA is home to the largest trillium population in North America – if you happen to be hiking in April. Shenandoah National Park. (9 mi. )The AT can of course be accessed for free at many places in Shenandoah National Park and at several places between the cabin and the Park. The Front Royal Trolley route stops at the AT where it crosses Rte 522, Remount Rd. There are other shuttling services that you can schedule for pick-up or drop-off at any point where the AT crosses Skyline Drive. (Or visit a waterfall: SNP Waterfall Hikes). Massanutten Mountain / Fort Valley / Elizabeth Furnace area. Just driving around the area anywhere is fruitful, with surprises around every bend. Some of our favorite haunts are cruising down through Fort Valley, over Chester Gap to Flint Hill (or our winery loop through Harrell’s Corner), down Browntown Rd and out Bentonville Rd or Buck Mountain Rd, and of course Skyline Drive. Then for a totally different perspective canoe/kayak/tube down the Shenandoah River. Visit a dozen wineries within 20 miles of the cabin. Here’s a good mobile app. Loop #1 featuring 5 of our favorites. Loop #2 featuring 6 of our favorites. Loop #3 featuring 7 of our favorites. beautiful drive down Browntown Rd with spectacular scenery. Local Wineries (alphabetically – our favorites in bold). Aspen Dale Winery 540 364-1722 | Delaplane, VA | 9.8 mi. Barrel Oak Winery 540 364-6402 | Delaplane, VA | 14 mi. Chateau O’Brien 540-364-6441 | Markham, VA | 8.4 mi. Chester Gap Cellars 540 636-8086 | Front Royal, VA | 14.3 mi. Chrysalis Vineyards 540 687-8222 | Middleburg, VA | 31.9 mi. Delaplane Cellars 540 592-7210 | Delaplane, VA | 15.8 mi. Desert Rose Winery 540 635-3200 | Hume, VA | 9.7 mi. Fox Meadow Vineyards 540 636-6777 | Linden | 2 mi. Gadino Cellars 540 987-9292 | Washington, VA | 29 mi. Glen Manor 540 635-6324 | Browntown, VA | 16.2 mi. Grey Ghost Vineyards 540 937-4869 | Amissville, VA | 31.47 mi. Linden Vineyards 540 364-1997 | Linden, VA | 6 mi. Little Washington Winery 540-987-8330 | Washington, VA | 29.6 mi. Marterella Winery 540-347-1119 | Warrenton, VA | 28.2 mi. Mediterranean Cellars 540-428-1984 | Warrenton, VA | 28.3 mi. Molon Lave Vineyards 540-439-5460 | Warrenton, VA | 36.8 mi. Naked Mountain Winery 540-364-1609 | Markham,VA | 9.9 mi. Narmada Winery 540-937-8215 | Amissville, VA | 31 mi. Pearmund Cellars 540-347-3475 | Broad Run, VA | 29.3 mi. Philip Carter Winery 540-364-1203 | Hume, VA | 11.7 mi. Rappahannock Cellars 540-635-9398 | Huntly, VA | 16.7 mi. Sharp Rock Vineyard 540-987-8020 | Sperryville, VA | 40.8 mi. Three Fox Vineyards 540-364-6073 | Delaplane, VA | 13.4 mi. Unicorn Winery 540-349-5885 | Amissville, VA | 36.2 mi. Veramar Vineyards 540-955-5510 | Berryville, VA | 35.1 mi. Or visit a waterfall: SNP Hikes to Waterfalls. Bryce is about an hour & 10 min away. 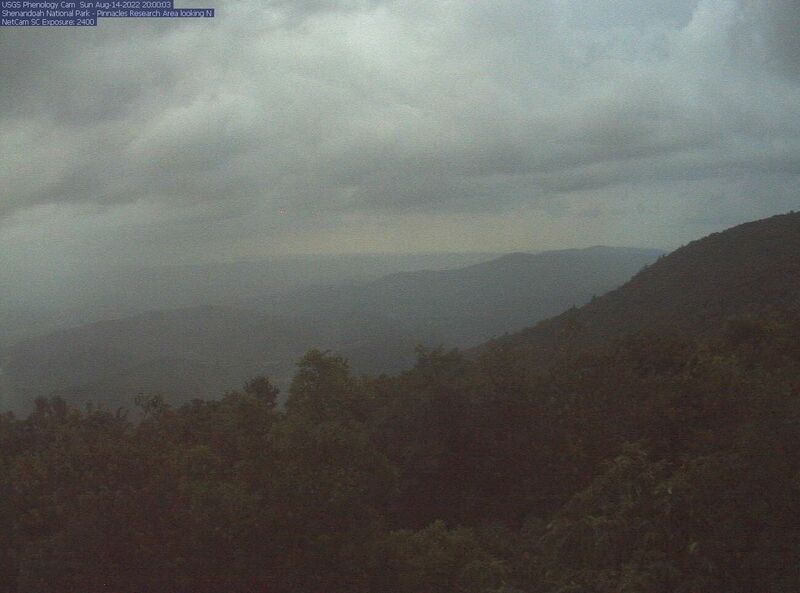 Massanutten is about an hour & ½ away. Wintergreen is just over 2 hours away. area are rather small, so reservations are a wise precaution. Virginia now allows dogs at the proprietor’s discretion. 40 Riverton Commons | 540 749-2440 | Coming Soon!
? (5-1 Tue-Sat / 5-11 Sun)? A treasured Front Royal tradition since 1972! Talk of the Mountain Seafood (Crab cakes to-die-for!